I've written before about that magical 8.9 mile run in November. Before that day, the most I could eek out was a mile or two or MAYBE three, but I hated it so much and really wanted to quit. I'm not sure what kept making me go out and run at that point, besides just sheer determination to get past three miles. It wasn't a huge deal, I mean - it was a huge deal to US, my friend recognized at mile four, at mile five, six, and so on... this was a big deal. I kept telling her - this run was teaching me more about the Lord's ability to perform something in someone than anything I'd ever experienced. It wasn't just that I was running such a longer distance, I was LOVING it, enjoying it, talking through it and planning to do it again. What I haven't written a ton about was what happened twenty four hours after that run. When two loving friends sat me down and used the "d-word" in a serious, we're concerned about you, this-is-a-big-deal-kind-of-talk. Hilariously, I think I responded with some pretty messed up statements. I don't have TIME to be depressed. My husband is planting a church, we're in the middle of transition - moving to Boston, I have three kids! My normal cycle for a long time had been a) function in way that knew God's help was nearby, but refuse it with an intense desire to be a good __________ on my own, b) when I failed or when life failed, lose my mind for about fifteen minutes and finally c) somehow, being very quiet and very still, ask the Lord to put me back together again in His grace (my most unfavorite word at the time) so that I could try my hardest to perform on my own again. That cycle had left me a little battered, maybe even depressed. Long story short, Boston was postponed. With the intention to go later and all arrive as healthily as we possibly could. We settled in Columbia and I settled into counseling. And I kept running. My counselor would give me these beautiful and really intense bits of homework each week, and some of it was so hard to do. I quickly realized, that if you're thinking on the state of your heart while preparing pb&honey sandwiches, and begin crying, your two year old will freak out. If I got up early to work on my "homework", sometimes I was in a yucky place all day. 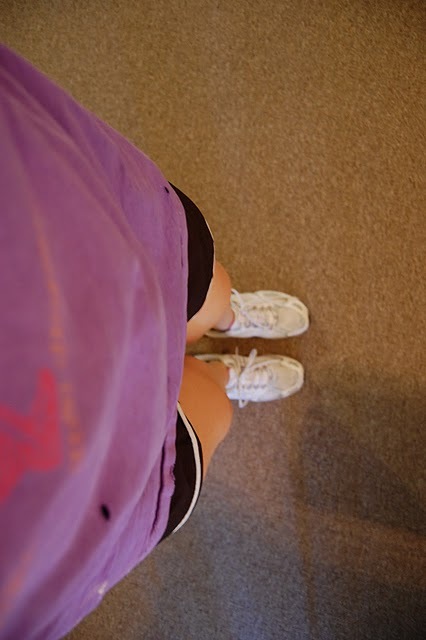 Running became my second counseling session of the week, time to process my hard questions. When you ask a performance-driven stay at home mom who doesn't really like the concept of grace "what do you NEED, Jessi? ", she wants to throw a small couch pillow at you and say, "NOTHING! What do you need?! Seriously, can I get you some coffee?!". I remember running and losing myself in the miles on that one. Lord, is it all right to need something? Would You tell me what it is I need and how I can rely on You to get it? Ps: I really don't want to do this. Then there was, "Jessi, you seem to bring a lot of outside rejection and anxiety into simple conversations, can we talk about that?" No, sweet counselor - we can't right now because that would be a little too vulnerable and I would lose my junk in this office building, but I promise to think about it on my run this weekend. "Do you believe God really wants good for you? Why not?". That one took some outside time as well. Um, a lot of outside time. So I kept running, and processing. And in His really sweet grace and love, He'd given me that first run to look back on. If He could do that, cause me to run that miraculous nine-ish miles - from start to finish, I believed He could finish this pain that was causing my heart to be depressed. He's done HUGE things, bigger things, much more miraculous things - but it was that run, with my short-stubby-non-runner legs that really showed me faithfulness. AND THE PROGRESS! Against my own desires, I was still running. Longer and faster, and more and more. And who noticed how hard it was anymore, when I had these intense questions to mull over as I went. And He was answering them. And she suggested for my next run, to just celebrate. Praise the Lord with each step. Worship Him and thank Him for His healing and for His grace (favorite word now!). Stop wrestling and enjoy His presence and His relationship, and that He calls you His daughter. And I did. And somewhere during that ten mile run, I laughed to myself thinking, "ha! I've been running this whole time?! who knew?!". I didn't ever go on a long run with the extreme dedication to prove to myself that I could do it. I usually went with the assumption that He'd allow me to run as far and as long as I needed to, for Him to sort out what He needed to, in my heart. And He always did. But it was never about me or any dedication I had. Just a lady running out of desperation, running towards healing and the Lord, and finding herself in love with running at the end of it. By accident. So now, in this season of healing and intense joy, each running step is different. It's exultant and excited. But I know that when another hard season comes, of any kind, the other sort of running will be there. To escape and wrestle and pray and cry out to Him. And I'll have my shoes ready. Lastly, here are they lyrics to song I listened to a good deal when I first began running. The singer is constantly stating, "I have to believe _________", with statements that are true about the Lord. I think it can be sung with resignation when you absolutely do not want to believe and yet, you know Jesus is literally all you have. You know, when you want to give up or give in, but a small, miniscule shred of your heart is telling you - you HAVE to cry out. It can also be sung from the viewpoint of "I HAVE TO" because your heart is literally bursting at the seems to believe in the Lord and claim His work in your heart. I recommend listening to it whichever place you're in.